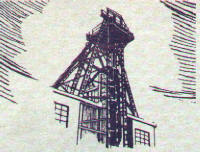 St. Joe Headframe, St. Joe Minerals Corporation, Bonne Terre, Mo. The story of St. Joe is of a relentless and successful search for new mineral deposits, of finding better ways of taking ore from the ground, of efficiently processing it into useful industrial materials and of developing new and larger markets for its commodities. The story of St. Joe is also the story of the personalities who initiated and developed the mining operation and lent culture to an isolated spot in the hills of St. Francois County while at the same time they faced and overcame handicaps that would crush men of lesser stamina. St. Joes story began on March 25, 1864 when Lyman W. Gilbert, John E. Wylie, Edmund I. Wade, Wilmot Williams, James L. Dunham and James L. Hathaway incorporated the St. Joseph Lead Company under the laws of the State of New York. To all intend and purposes it was just another of the many stock-jobbing ventures that were in existence at that time. Few of the incorporators knew or cared much about the mining business. Since lead had been mined in southeastern Missouri from the time of the earliest French and Spanish explorers, James L. Dunham, one of the incorporators contacted a Mr. Anthony LaGrave who owned 946.32 acres of land in and around the present town of Bonne Terre. This entire acreage was purchased by the St. Joseph Lead Company for $25,000 cash and three notes in the amount of $25,000 each. These were reduced later to two notes of $25,000 each. St. Joseph Lead Company now owned land of which the lead content was not known and was in debt $75,000 with most of its stock sold and little cash on hand. A young lawyer by the name of J. Wyman Jones with a modest practice in Utica, New York had accepted a block of St. Joe stock as partial settlement for a debt owed him by one of his clients. The acceptance of this stock destined Mr. Jones to play an important part in building an organization that was to become one of the great lead and zinc mining companies of the world. Seeing a notice in a New York paper, announcing a stockholders meeting of this new company in which he was now a stockholder, Mr. Jones decided to attend. It was on June 13, 1865 that he attended this meeting and became involved in a venture that was to set his future life. A most discouraging picture was painted and many of the stockholders learned for the first time the encumbrances upon their property. So many embarrassing questions were raised that the meeting was adjourned. At a reconvened meeting, Mr. Jones was asked to visit the property in Missouri and to assume the presidency of the St. Joseph Lead Company. Upon acceptance of the presidency, Mr. Jones started his trip to Missouri. We will not attempt to enumerate the trials and inconveniences encountered on such a trip from New York to the property in the wilderness of Missouri. Equipment was crude and inefficient. Furnaces were old-fashioned stone ovens, which sloped to the front with a large firebox for wood beneath. Separation of the rock from the lead was done by a process called jigging. The jigging machine, used at that time, is described as a long heavy pole lying across a large log or wooden horse with a water-washed sieve filled with crushed ore. Constant short, sharp motions by a man on the end of this pole would move the material in the sieve up and down in the water. The heavy particles of lead would sink to the bottom while the lighter particles of stone would remain at the top. In 1865, two blast furnaces were erected for smelting of lead but were not satisfactory and were abandoned. In early 1866 a reverberatory furnace the output of pig lead could be increased as far as it was practicable to hire and accommodate men. From a copy of the report to the stockholders for 1866 we find that a new Resident Superintendent, J. C. Winslow, was employed for the Southeast Missouri operations and a number of Cornish miners, so called Cousin Jacks, were brought in. Incidentally, many of these Cornishmen have left descendants who are an important part of our present population. Two hundred fifty tons of pig lead was sold in 1866, which was more than double the sales of the previous year. President Jones was exhausted and thoroughly worn out with the many trials and tribulations he had encountered as head of the mining venture in the wilderness of Missouri. Soon after the annual meeting of October, 1866 he and his family left for Northampton, Massachusetts for a vacation and rest. It was here that Mr. Jones met Dr. Charles Bunyan Parsons a man who was to play an important role in the development of the lead mining area in southeast Missouri. His work and ingenuity were instrumental in developing processes of ore extraction. Dr. Parsons education was in the field of dentistry. He set up his office in Hillsdale, Michigan and practiced there until the outbreak of the Civil War. He volunteered and was commissioned a Captain in the Union Army. He was forced to resign his commission in March of 1863 due to bad health. Persuaded by his doctors that he must get into some profession where he could be out of doors more than his dental practice would allow, he accepted a job with a small mining company in Northampton, Mass. During many of the evenings in Northampton, Mr. Jones told Dr. Parsons all about the new mining company in southeast Missouri  the many troubles encountered getting it underway and the tremendous possibilities that lay ahead. Here were two men of entirely diverse educations and professions thrown together, a dentist and a lawyer, discussing lead mining, neither of who knew too much about the intricacies of treating ore.
Toward the end of Mr. Jones vacation he asked Dr. Parsons if he would make a trip to Missouri and there investigate the property and then return to New York and make a report to the Board of Directors. Finding a convenient time to make the trip, Dr. Parsons made a close inspection of the southeast Missouri property and gathered what information he could. He returned to New York to report to the Board of Directors. He presented so much new information of value and because he had grasped the problems so effectively, he convinced these men that he was the man needed to assume charge of their operations in southeast Missouri. Dr. Parsons was offered the position of Resident Manager but hesitated to accept until he had discussed it with his wife. He had married a very charming lady in 1862 and he felt that it was beyond all decency to drag her so far from things that she had been used to and set her down in a wilderness where there was little else than mud and a few log cabins. He asked for more time before giving his answer to which the Board readily agreed. Dr. Parsons was inclined to accept this challenge of his skill and ability but he cautiously outlined the proposal to his wife Jane with the full expectancy that she would refuse to go to the wilderness of Missouri. She might have refused had she been acquainted with a chigger or had she ever seen a tick. Much to his surprise she agreed and told him she felt this was the thing which could be beneficial to his health. On the first of May in 1867, Dr. Parsons associated himself with the company and he and Mrs. Parsons started on the long trip to Missouri where they were to spend the remainder of their days. Late in May, Dr. Parsons arrived and assumed his duties as Resident Manager of the Southeast Missouri operations. The Works consisted of one small crushing mill, one set of Cornish rolls, three reverbertory furnaces and a few hand-operated jigs. Ore was gathered from so-called Openings which were no more than shallow pits and a few inclined drifts extending to the bed rock. Dr. Parsons first efforts were to increase production. More pumps were purchased to keep the inclined pits dry so work could continue daily. 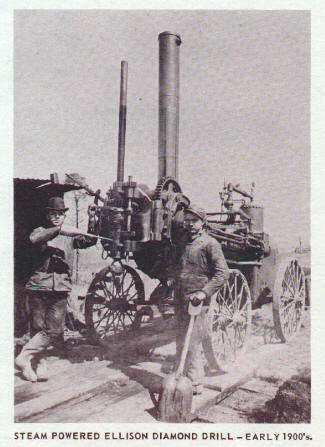 Several more furnaces were installed and the Parsons Mechanical Jig was installed which was an improvement over the one-man job. There is no doubt but that the enthusiasm and wisdom which Dr. Parsons brought to Missouri were the reasons that the company survived those early days. Dr. Parsons great interest in his company combined with his unequalled skill in handling men and inspiring in them the same enthusiasm he possessed, did much to establish the integrity and reputation of the little mining camp. Perhaps it could be expected that Dr. Parsons increased expenditures would be questioned by some of the stock-holders. They had already expended more than they felt justified in doing and hesitated to throw more money into the business. This created quite a hassle, but Dr. Parsons ultimately proved himself right by processing enough lead to pay a small dividend. This small dividend persuaded the Board of Directors to issue one hundred thousand dollars worth of bonds, which were sold to the stockholders. In January of 1868 the company was free of debt with the exception of that owed the stockholders. As mining activities continued, it was found that by sloping underground a better grade of ore was encountered and much better protection for the men was provided from the inclement weather. 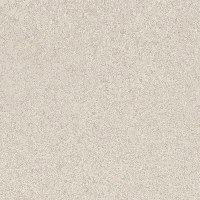 Another economic advantage resulted in that the overburden of dirt was not removed. Men were able to work successfully the entire year. One of the locations known as 1095 or the Bonne Terre supply shaft, produced good ore as far down as thirty-five feet in the clay and seemed to get better toward the bottom of the drift, with lead ore imbedded in it, convinced Dr. Parsons that good values lay in the rock further down. With sledge hammers and drills they continued downward using black powder to blast the lead contained rock. This is perhaps the first record of hard rock mining in this district. Dr. Parsons immediately wrote President Jones regarding the experiment in hard rock mining and asked permission to continue the experiment. Dr. Parsons had read an article in a magazine regarding a new invention called a diamond drill. This device would cut deep into the rock and bring up samples of the rock through which it had drilled. Mr. Jones felt this device seemed to have application to the lead mines. He owned a plot of land near Peekskill-on-the-Hudson under which was reported to be a valuable body of find marble. He contacted the inventors, Severance and Holt, and contracted them to drill his property. The fact that the diamond drill proved the marble was of no particular value convinced Mr. Jones that his device had great possibilities for the lead mines. He presented his report regarding the diamond drill to the stock-holders hoping that they would approve the necessary money to move the drill and an experienced driller to Missouri. He was met with an unexpected refusal. Their objection was that more ore had been discovered than could be processed in several years. 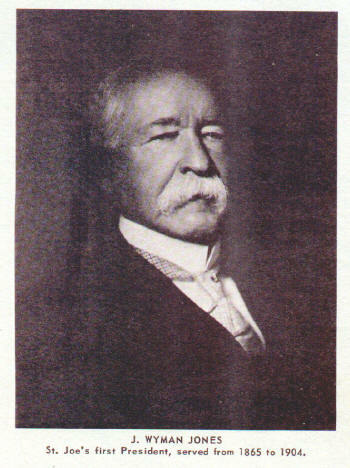 Mr. Jones had one enthusiastic backer in Mr. Hugh N. Camp, Sr., Treasurer of the company, who agreed that although much ore was in sight there was nothing to prevent the companys expansion. Increasing the output of the mines would thus earn additional money. Mr. Jones and Mr. Camp advanced the necessary funds to move the drill to Missouri. On March 5, 1869, the drill arrived at the mine along with Mr. Albert Shepherd who had operated it at Peekskill. Mr. Shepherd lost no time in setting his rig in operating order. The first drilling was started close to the Hathaway incline (1095) and reached the depth of ninety feet but disclosed only a few specks of ore. Moving southeast about fifty feet and drilling to a depth of seventy-five provided no better results. It was discovered later that had this hole been drilled some thirty feet deeper a fine body of ore would have been discovered. The use of the diamond drill was the first step toward progressive modernization. In the years to follow large areas of good ore were discovered as the diamond drills continued to reveal the character of the rock and minerals imbedded therein. The discovery of new ore bodies and increased production necessitated drastic changes in the smelting process. Several types of furnaces had been tried and none proved too satisfactory. Mr. Gustave Setz, a highly skilled metallurgist from Germany, was employed on February 1, 1879 to take charge of the smelting operations. By April 10th he succeeded in adapting the McKenzie furnace to operate fairly efficiently. Fourteen calcine furnaces were installed to drive off the sulfur. This roasted ore was sent to two stacks of cupola furnaces where, when mixed with charcoal or coke, a heavy blast of air quickly reduced the ore to its metallic state. Mr. Setzs technical skill proved invaluable to the company in those early days. He remained as smelter superintendent for many years, became a stock-holder, and in 1900 was made a member of the Board of Directors. When the smelter was later moved to Herculaneum, Missouri, Mr. Setz was placed in charge. His contributions did much to make the refinery a success. With the increase in production and sales, it soon became apparent that the construction of a railway was an absolute necessity. Numerous attempts had been made to find a satisfactory route to replace the crude wagon transportation used by St. Joe. The wagon roads, if they could be called roads, were mere tracks through the woods. After some use, these roads became continuous mud trenches. When the teams pulled heavy-laden wagons through these trenches, the wheels often sank up to the axles. Hauling was slowed to such an extent that it became impossible to secure enough teams to handle the job. The much-needed railroad, some 13 � miles, was completed in January 1880 to the Summit station of the St. Louis, Iron Mountain and Southern Railway. The annual reports to the stockholders for 1880, 1881 and 1882 each reported material gains in metallic lead produced and sold. The 1882 report states that production reached a high of 15,214 pigs of lead weighing 81.5 pounds each. Net profits for the year were $200,000. At this point in history of the company when many of the problems seemed to have subsided and profits were on the increase, a major disaster occurred. It was a cold Sunday morning, February 26, 1883, shortly after the shift had gone home when flames broke out in a portion of the mill. Because of insufficient fire fighting equipment and strong north winds, it was only minutes until the entire mill was engulfed in flames. The St. Louis newspapers called it a quarter million dollar blaze and predicted the end of the St. Joseph Lead Company. They were wrong for they did not know the temper of these men who had suffered other serious setbacks and still had carried on. The embers of the fire had hardly cooled until reconstruction of a new mill was underway. A new 900-ton capacity mill was completed in four months at a cost of $222,000. The smelting of lead required many cords of wood daily making it necessary that the company own large acreages of timberland. One such acreage was a 344-acre tract called Penn Diggins, which later proved to contain a very rich deposit of lead. 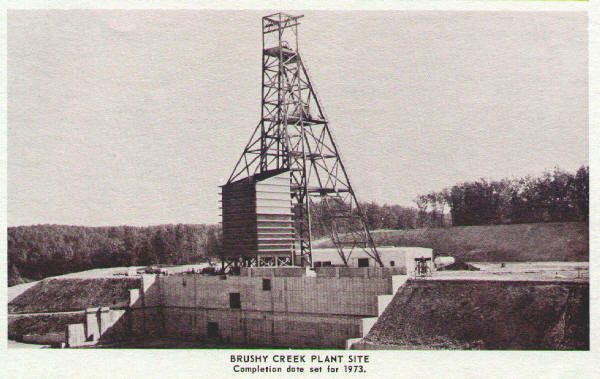 In 1886 the Penn Diggins shaft was sunk and the lead produced from this tract not only made it possible to pay for the new mill, but also financed the building of a new railroad connecting the Lead Belt and the Mississippi River and thereby effecting a drastic reduction in shipping costs. Other acquisitions of land in the vicinity of the present town of Leadwood such as the McKee Diggins, T. W. Hunt tract, Hoffman tract, Jake Day tract all proved to contain rich deposits of lead. Shortly after the purchase of the Hunt tract a shaft was started and operations were underway in a fairly good orebody by the end of 1900. Houses were built for the employees, and in a short time the town of Huntington was in existence. On August 4, 1900, the Hoffman tract was purchased and a shaft sunk during 1901. Again carpenters were brought in and houses were built for the employees along with a company store. On October 12, 1901, a Post Office was established using the name of Owl Creek after a stream nearby. The citizens disliking the name Owl Creek, petitioned the Post Office Department to rename the town to that of Leadwood and such was approved in 1902. Since the Hunt and Hoffman tracts were producing large amounts of ore, it was decided to build a processing mill. By the spring of 1904, a new 1200-ton capacity electrically operated mill was in operation. A branch of the Mississippi River and Bonne Terre Railroad, named the Hoffman branch, was built to handle materials from Bonne Terre to the bluffs on the north side of Big River. An aerial tram was erected in 1901 spanning Big River from the bluffs and terminating near Hunts shaft. A switchback was in use north of Big River in 1902 so that trains could be brought down to the lower level on the south side. A trestle built across the river now made possible train transportation in and out of the town of Leadwood. The St. Joe venture in St. Francois County was attracting considerable attention through the area. Just north of St. Joe property in Bonne Terre was a tract of land originally granted to Jean Bte. Pratte, designated as U. S. Survey No. 3099. It was this tract of land that attracted the interest of the Desloge family. As a merchant in Potosi, Firman Desloge had handled lead ore. A charter was requested and granted to the Missouri Lead and Smelting Company on June 5, 1874. The corporate name was changed to The Desloge Lead Company on February 21, 1876. 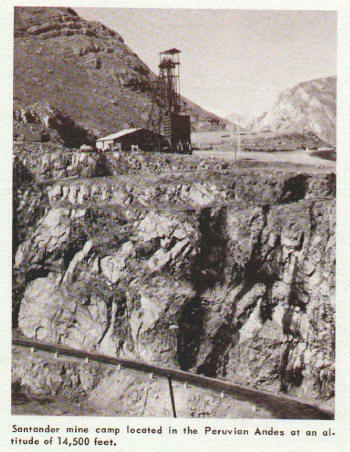 Three shafts were sunk during 1876 and 1877 and a new mill was built. A fire in March of 1886 destroyed the mill and did great damage to the entire surface plant of the Desloge Lead Company. Rather than rebuild, the Desloge Lead Company was sold to St. Joe. 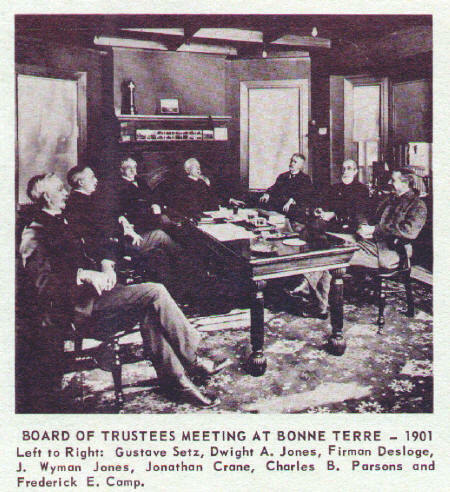 In the same year Mr. Jones, with other Trustees, formed the Doe Run Lead Company, which was subsequently absorbed by St. Joe. 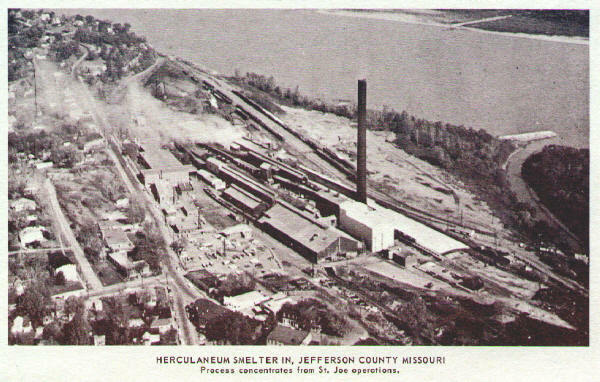 In 1890, St. Joe began construction of the large smelter at Herculaneum, Missouri, to process concentrates from its Missouri properties. During the early 1890s many new mining companies were formed in St. Francois County which merged with the larger companies and later became a part of the St. Joe operations. Some of the newly formed companies in St. Francois County were the Desloge Consolidated Lead Company, Flat River Lead Company, National Lead Company, Doe Run Lead Company, Central Lead Company, Federal Lead Company and Theodore Lead Company. 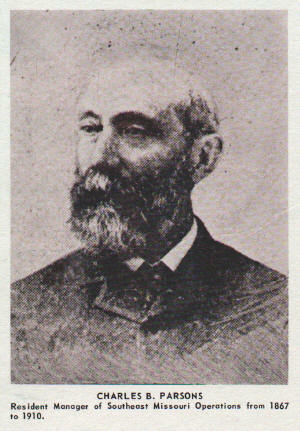 Mr. Wyman Jones died on October 27, 1904 at the age of 72. During his 39 years as President, St. Joe had grown from an uncertain operation producing a little more than $17,000 worth of salable goods in a year to a company which had distributed $1,774,000 in dividends, invested another $1,750,000 in permanent improvements, and was responsible for creating a thriving community of 5,000 persons at the center of its operations in Missouri. 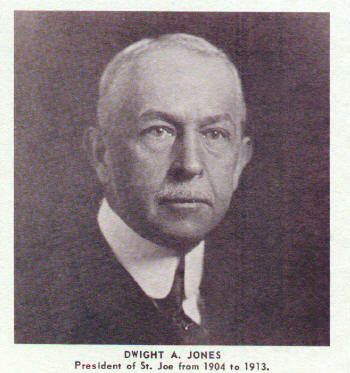 Dwight A. Jones, who had been with the company nine years as Secretary and Trustee, succeeded his father as President. The problems confronting him were quite different from those that the founders had faced. The chief difficulty was to maintain the Companys momentum. Dwight Jones overcame this obstacle with conspicuous success. He saw clearly that the Company would have to acquire new properties and build new plants to meet the rapidly changing conditions of the new century. This was not always easy. Aggressive new mining interests had come into southeastern Missouri, and St. Joe had to compete vigorously in its efforts to obtain title to land with ore-bearing potential. Between 1890 and the Panic of 1907, St. Joseph Lead Company spent or committed almost $10,000,000 for new land and plant equipment. In 1907 Panic set in motion forces that created new problems for the industrial community. During the next four years, St. Joe and Doe Run (then still a separate entity) ran up short-term debts totaling more than $8,000,000. Dissatisfaction was expressed vigorously by a minority of stock-holders, and St. Joe became involved in litigation and controversy that for awhile threatened its existence. The Doe Run Lead Company was merged into St. Joe and the Company went ahead on an entirely new footing. At this point in the history of St. Joe, January 23, 1910, Dr. Parsons, who had served as Resident Manager of the Southeast Missouri operations, died at his home on the Mississippi River at Riverside. Prior to his death, his two sons, Roscoe and Girard, had taken over a great deal of the management of the company. 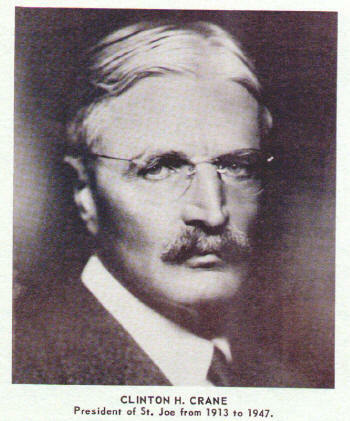 At the annual meeting of stockholders in 1910, Mr. Roscoe R. S. Parsons was elected a Trustee of the Company and appointed Resident Manager to succeed his father. Roscoe Parsons made many changes in an effort to effect improvement in operations and to improve economics. Air locomotives replaced mules in 1911 on the mainline haulage at Leadwood. The Bonne Terre mill was equipped to operate electrically. Electric motors replaced the outmoded steam engine. Mr. Dwight A. Jones, who had served as President of the Company since his fathers death in October 1904, died December 6, 1913. Mr. Clinton Hoadley Crane was elected President of the Company on December 12, 1913. 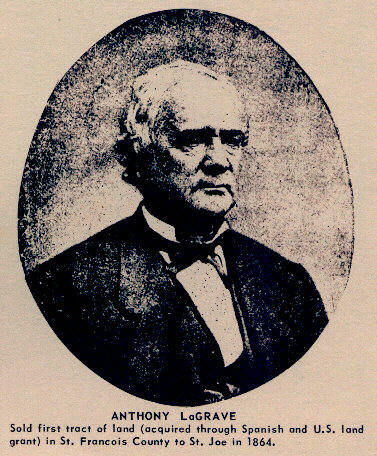 He had served as a Trustee following the death of his father, Jonathan Crane in 1911. As a Trustee, he made an important contribution by his comprehensive knowledge of engineering, which he had acquired as a naval architect. He fully understood the principles of mechanical power and he saw how to apply it to St. Joes needs in an era of increasing mechanization. He also had the same gifts as his predecessors  the capacity to grasp important issues and the ability to select capable men to weld together an efficient organization. Mr. Crane was insistent on studying the problems himself so he made frequent trips to the Lead Belt, making detailed examinations of St. Joes procedures as well as those of its competitors. During the latter part of 1914, Mr. Crane brought to the Lead Belt, Mr. Charles J. Adami, of Butte, Montana, who assumed the position of General Manager of the Southeast, Missouri operations. On March 1, 1915, Mr. Adami brought to the Lead Belt another man from Butte, Montana, who was destined to play an important role in the modernization and mechanization of the St. Joe properties in Southeast Missouri. 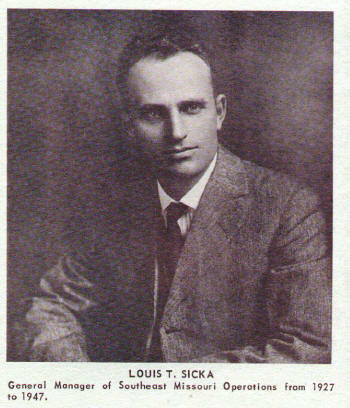 This gentleman was Louis T. Sicka, who later became General Manager. By the end of 1915, two years after Mr. Crane had taken office; St. Joe had paid off practically all its debt. 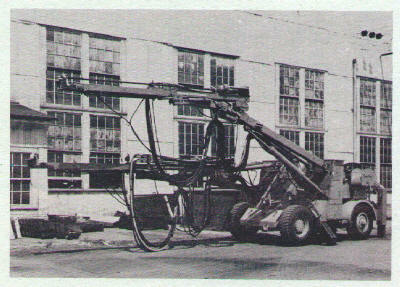 It was modernizing its methods, notably by introducing the flotation technique in its concentrating mills, effecting substantial savings. It had established its own sales force, a far-reaching step which did much to fortify and extend the already high reputation enjoyed by St. Joe products throughout the United States. Progress and Expansion were steady throughout the years of World War I and the pre-Depression era. 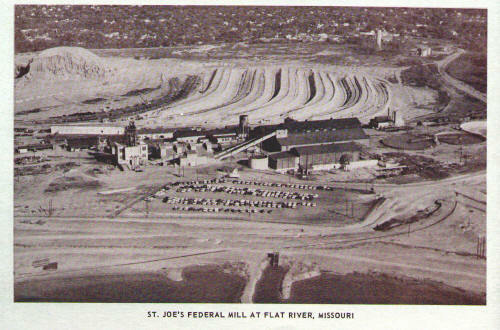 St. Joe acquired a number of mining properties in the Lead Belt, the most important of which was the Federal mine, purchased from the American Smelting and Refining Company in 1923. It expanded its underground rail system and consolidated these properties, including the Federal mine, into a network of more than 250 miles of narrow gauge track, running under the towns of Flat River, Leadwood, Desloge, Rivermines and Elvins. This system of underground transportation greatly increased the efficiency and effected large savings in costs. It eliminated expensive surface haulage, consolidated maintenance of equipment, and centralized the work of hoisting ore and lowering supplies underground. During Mr. Cranes administration in 1925, St. Joe became interested in foreign operations and investigated an outcrop of lead ore that had been discovered about 2,000 feet below the summit of a 17,000 foot mountain in northern Argentina, not far from the Bolivian border. After extensive exploration, which revealed the presence of a rich lead-zinc-silver orebody, the Company exercised its option on the property. Today, the Aguilar mine not only is a most important mining operation in Argentina, but is one of the worlds outstanding lead-zinc-silver mines as well. 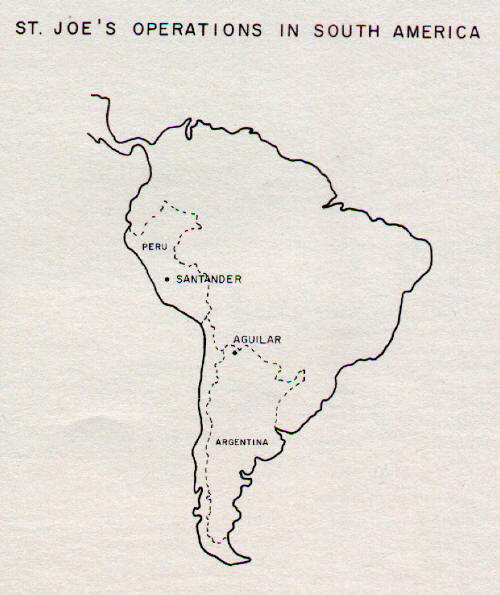 Included in St. Joes foreign operations today is another lead-zinc-silver mine called Santander, which is located in the Peruvian Andes Mountains some 14,500 feet in elevation. Another important development during Mr. Cranes long administration was St. Joes entry into the zinc field. The Edwards and Balmat properties in upstate New York were purchased from the Northern Ore Company in 1926. 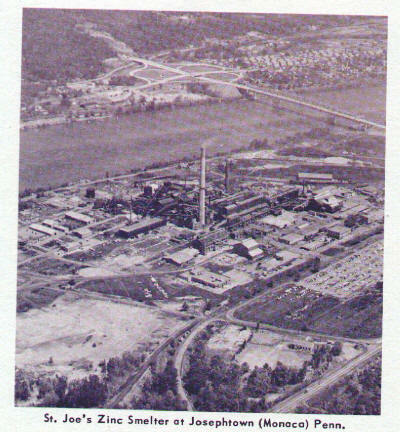 A smelter at Josephtown was built by St. Joe to produce zinc oxide and later zinc metal from the concentrates supplied by the Edwards and Balmat properties. Going into the thirties or Depression era, St. Joe like many other companies, was confronted with little or no sale for its products. 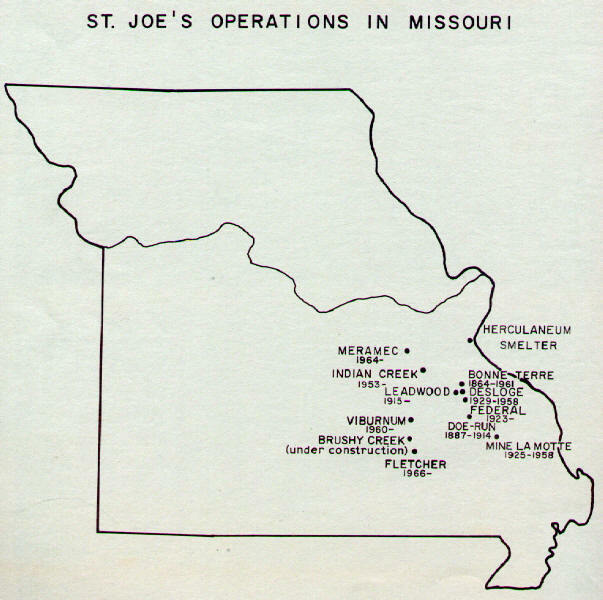 Rather than close operations, as many did, St. Joe in 1932 curtailed its operations to one week per month. During the summer months, St. Joe provided garden spots for employees that they might raise food for their families. During the winter months permission was given to cut wood off company lands for heating and cooking purposes. During the depression years St. Joe borrowed $10,000,000 and stockpiled thousands of tons of lead concentrates in order that each employee might have some money for his family needs. Operations were back to a five-day workweek schedule by the end of 1936. Operations were changed to a six-day every other week work schedule in the spring of 1938. Hitler and his German army were on the move in Europe toward the end of 1938 and St. Joe returned to a five-day work week schedule. With the World War II years to follow, things sky-rocketed all over the country. 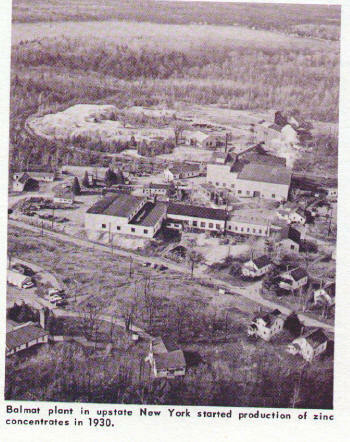 St. Joe had in excess of 3,000 payroll employees working in the Lead Belt area by the end of 1945. It was during these years that the payroll employees became unionized. Mr. Crane was succeeded as President in 1947 by Mr. Andrew Fletcher, a graduate in mechanical engineering from the Sheffield Scientific School of Yale University. 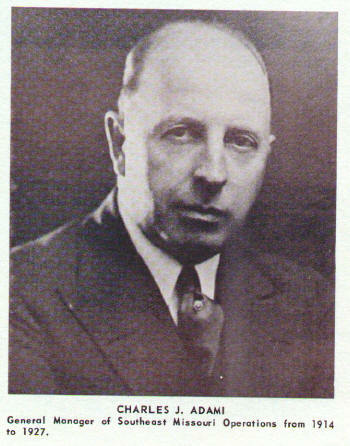 Mr. Fletcher had been a Trustee of the Company since 1921 and was Vice President and Treasurer of the Company from 1929 until 1947. 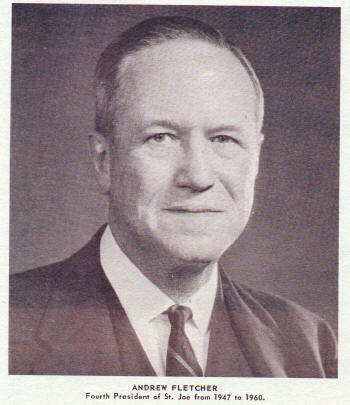 Mr. Fletcher served as President until February 16, 1960 when he was elected Chairman of the Board of Trustees, an office which had not been filled since the retirement of the late Mr. Clinton Crane. Mr. Fletchers contributions to the success of the Company were many during his Presidency. Today he is Honorary Chairman and head of the Finance Committee and a member of the Board. Mr. Louis T. Sicka, who had succeeded Mr. Adami as General Manager of the Southeast Missouri operations in 1927 was retired after having served the company for twenty years in that capacity. Mr. Sickas energy and enthusiasm were important to the successful accomplishment of the many changes and developments which took place during his years at St. Joe. 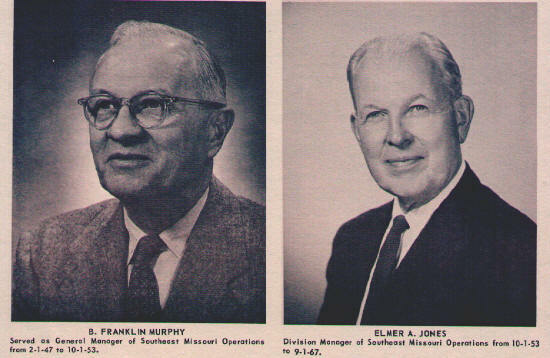 Mr. B. Franklin Murphy was appointed General Manager, replacing Mr. Sicka on February 1, 1947. Mr. Murphy grew up in St. Francois County and received his degree in mining engineering from the Missouri School of Mines at Rolla in 1910. Mr. Murphys plan of organization during his six years as General Manager resulted in standardizing practices in the mines, mills and shops of Southeast Missouri operations. Mr. Murphy was retired October 1, 1953. Mr. Elmer A. Jones became Division Manager of the Southeast Missouri operations in 1953 after having served twenty-seven years in various capacities, starting as a mining engineer in 1926. 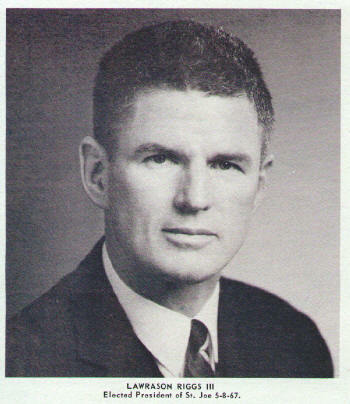 He was a member of the Board of Trustees from 1963 to 1968. He served as Vice President and Board Member of the Meramec Mining Company from 1963 to 1967. Mr. Jones is a graduate of the Minnesota School of Mines with a degree in mining engineering. Jumbo with two rotary percussion drills. While serving as Division Manager, he initiated many changes and innovations; the first trackless mine in Southeast Missouri, the first rotary drilling by large jumbo drills and the use of transloaders for loading and hauling. He helped establish the Mine Research Department, which conducts studies on rock mechanics. Mr. Jones retired on September 1, 1967. 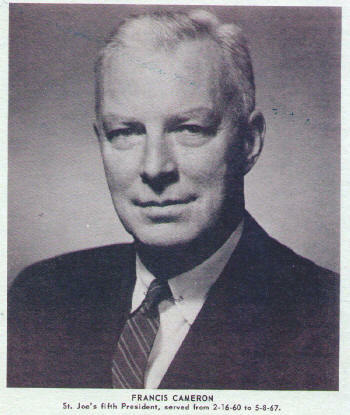 Mr. Francis Cameron was elected President of the Company on February 16, 1960 replacing Mr. Fletcher. Mr. Cameron, a geologist, came to St. Joe from Anaconda Copper Company in 1945. He was elected a Vice President in 1946 and Trustee in 1953. Prior to becoming President, he had general supervision of the Companys southeast Missouri mining and milling operations and its exploration programs. These exploration programs revealed many new ore bodies in Southeast Missouri including Indian Creek, Viburnum, Meramec and Fletcher. 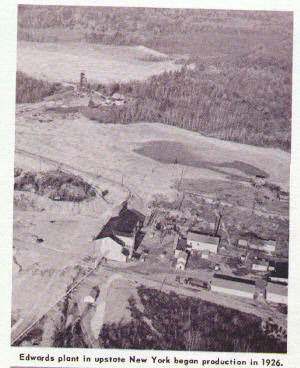 Indian Creek was the first of the major new lead mines in southeastern Missouri to be developed by St. Joe. This modern plant is located about thirty-five miles northwest of Bonne Terre in Washington County. 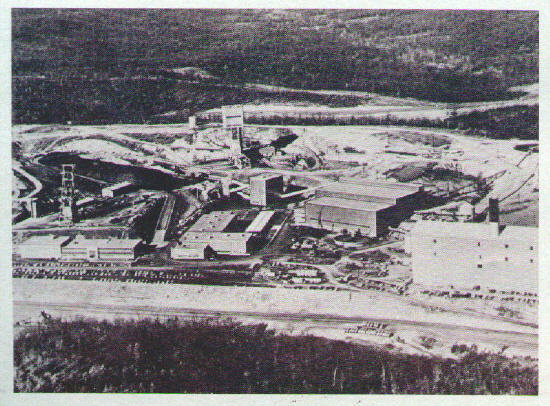 It started producing lead concentrates in December of 1953. 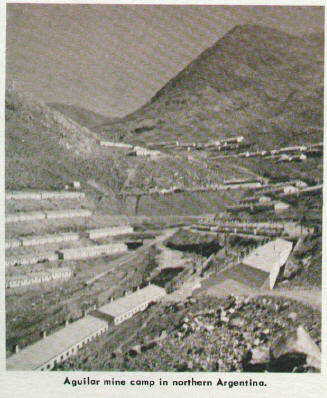 The Viburnum plant which began production in 1960 was regarded at the time as one of the most modern and efficient lead mining and milling installations in the world. The No. 27 mine is located at Crawford County approximately five miles northwest of the city of Viburnum.. No. 29 mine is located in Washington County some five miles northeast of Viburnum and the No. 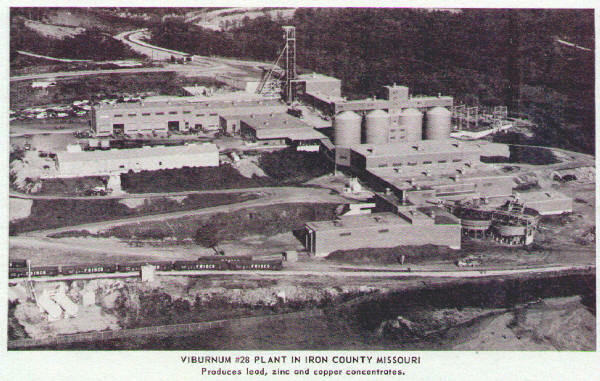 28 mine and mill are located in Iron County within the city limits of Viburnum. 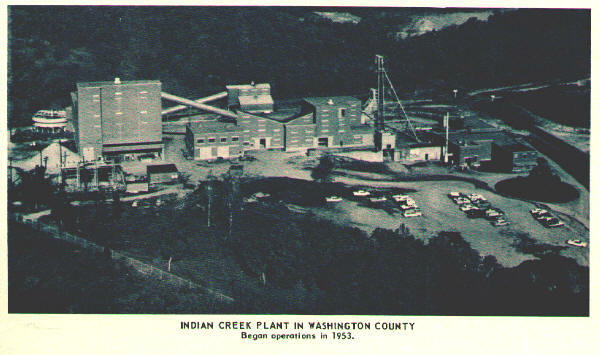 Began production of iron pellets in 1964. 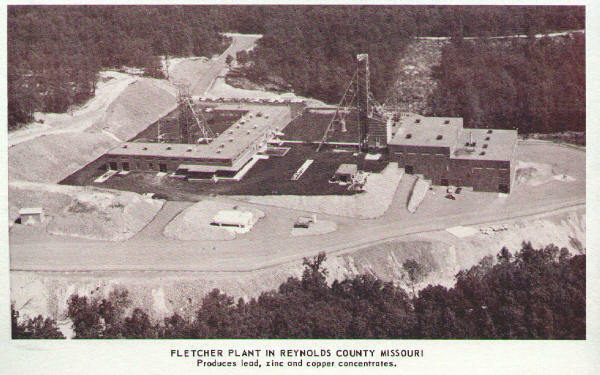 The Fletcher plant is located in Reynolds County about six miles east of Bunker and about fifteen miles south of Viburnum. It is the largest individual producer of lead in the United States. The first car of lead concentrates was shipped on February 28, 1967. The first car of zinc concentrates was shipped on March 17, 1967 and the first car of copper concentrates shipped on May 27, 1968. 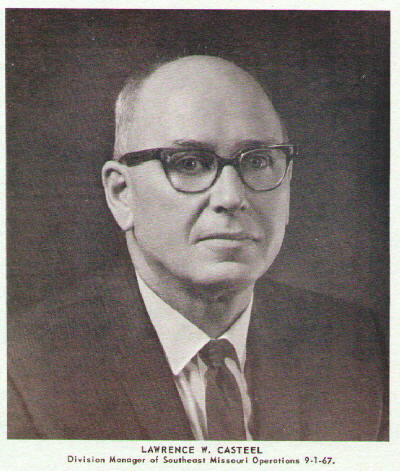 Mr. Cameron succeeded Mr. Fletcher as Chairman of the Board of Trustees on May 8, 1967 at which time Mr. Lawrason Riggs III became the sixth President of the St. Joseph Lead Company. Mr. Riggs attended St. Pauls and Harvard, graduating in mining engineering from Harvard in 1936. He received his Masters degree from Columbia University. Mr. Riggs started his career with St. Joe as a summer employee in 1936 at Balmat, N. Y. He began regular employment at the Bonne Terre mine October 3, 1939 as an Apprentice. He was called to active duty in the Navy in January, 1941 and served until September of 1948 as which time he was released from active duty after attaining the rank of Commander. Upon his return to the Lead Belt he assumed his duties as Mechanical Engineer at the Bonne Terre Shops. He served as Mine Engineer, Mine Captain, Asst. Mine Superintendent, Mine Superintendent, Business Repr. and Division Superintendent prior to being transferred to New Brunswick in 1954. He was transferred to the New York office in 1958 and Asst. Vice President and in 1960 became Vice President in charge of coordinating the Companys domestic mining and lead smelting activities. Mr. Lawrence Casteel assumed the position of Division Manager of the Southeast Missouri Mining & Milling operations on September 1, 1967, succeeding Mr. E. A. Jones who retired on this date. Mr. Casteel had been Asst. Division Manager since July 1957. Mr. Casteel is a graduate of the University of Missouri at Rolla where he received a Bachelor of Science Degree in Mining Engineering. He also holds an Honorary Master of Science Degree from the same school. 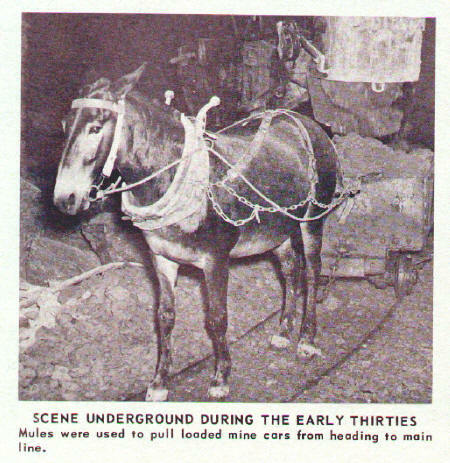 His first employment was on 6-3-37 as a summer employee in the Bonne Terre mine. After graduating in June 1938, he returned to St. Joe as an apprentice in the Bonne Terre mine. He has held positions as Mine Engineer, Division Superintendent, Asst. Division Manager and his present position as Division Manager. The company is continuing its expansion. A site is being cleared for a new mine and mill to be known as Brushy Creek. This site is located approximately six miles north of the Fletcher plant in Reynolds County. It will be similar in design and capacity as the Fletcher plant and will produce lead, zinc and copper concentrates. Completion date for the new plant is set for 1973. As we move forward in the second hundred years of mining, we know we cannot rest on our past success. Our leaders today, like those of the past, are men of vision with optimism, foresight and determination that St. Joe will always be a leader in the mining industry. This issue of the Headframe is devoted to the history of the St. Joseph Lead Company. In the interest of progress this name is gone from the "Big Board" at the New York Stock Exchange, but in the memories of many, it will live on, and the St. Joe Minerals Corp. will forever remain a stranger. One hundred six years of successes and failures and hopes and dreams can be erased only by the passing of a generation. For many the events and names mentioned in this issue will recall nostalgic memories of good times and of bad times; of jokes and fun; of hard work and blistered hands; of accidents and misery; of friends and nicknames - but the list is endless. Enjoy this issue. We shall not look back often. If we did, we might shed a tear and sentiment has no place in business. Or does it? Special thanks is given to Mr. Henry C. Thompson, St. Joe Pensioner and member of the Missouri Historical Society, for his very helpful hand in compiling this history of St. Joe. Many thanks to Jeannie Hunt Nassaney for transcribing the above article for us! !